Another little triumph on the treadmill at work during my lunch break..
As well as my normal walking, I managed to run 2 minutes at a steady 3 mph and just for the hell of it I ran a minute at 4 mph. The final minute at 4 mph made my legs turn to jelly and sweat horribly, but it raised my pulse and gave me a little bit of a cardio workout which will help in trying to reach my goal of 100lbs off by October 1st. The main thing is that I am taking things slowly, one step at a time, an extra minute jogging every-time I use the treadmill. 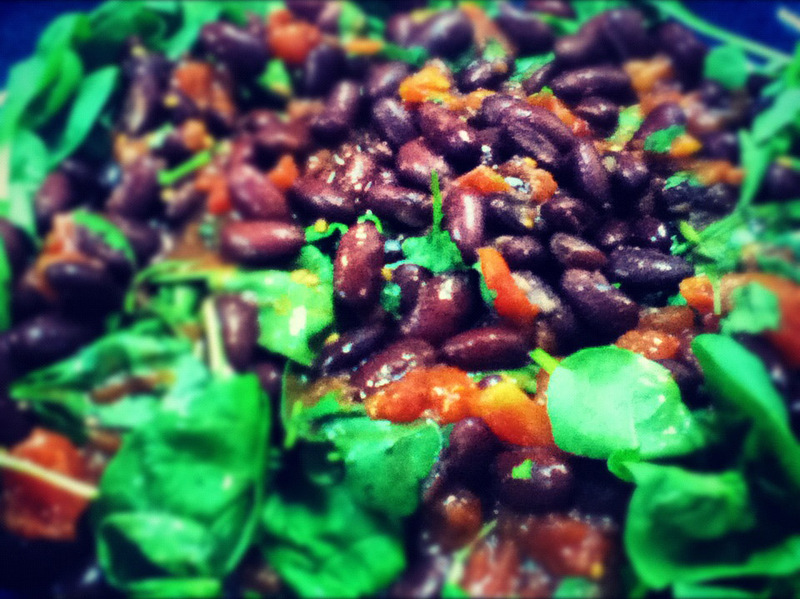 Today’s healthy lunch, chopped tomato, spinach and kidney beans.. I propped my iPod up and took a quick clip of my jogging efforts. Embarrassingly it sounds and looks like the treadmill is suffering under the weight of me. But if I can do this and think “the-hell-with-it” then you can too!! This entry was posted in Uncategorized and tagged jogging, learning to jog, losing 100lbs in 1 year, treadmill. Bookmark the permalink. I haven’t been reading my list of dailies for a while (blogs I like to read regularly – one of which is yours) so I’m just now getting an update on your progress. Which is fabulous, by the by. Shamefully, I haven’t done a lick of official exercise in several months. I have, however, done a ton of gardening so I’ve not turned into a complete slug. My weight was starting to creep up again so I’ve been trying something simple – just making sure I eat serving sizes of everything. I actually lost ten pounds just by that. So even those it’s seems like small thing, a few extra minutes of running for example, it’s like you say, “a little triumph”. You are doing a great job and writing a terrific blog the process! I think one thing I’ve really learned these past 10 months is that “moving” our bodies is an important part of losing a little weight or maintaining a healthy weight in addition to making some dietary changes… and those endorphins really do kick in especially when one sets little achievable challenges or goals- makes you feel good about yourself!